10 Must Eats in Kuwait - A Rose Is A Rose Is A Rose! As I travelled across the length and breadth of the Kuwait city, (It’s a small city by the way), one thing that I found in abundance is the eating joints. There are rows of restaurants, food joints, small and simple eateries to high end fine dining, international food chains to good value mid-range options, lining both the sides of the roads. Kuwaiti cuisine, they say is largely the one that is contributed by the immigrants from the Arab countries and South East Asia. So, Arabian, Persian, Bedouin, Pakistani, Turkish, Indian Iranian and Mediterranean dishes form an integral part of Kuwaiti food. Since, there are immigrants from all over the world in Kuwait, so there are a lot of American, Italian, Chinese, French, Thai, Japanese restaurants and food joints too. Our local hosts have been kind and generous enough to take us around and giving us insights about Kuwait. Thanks to them, we have been able to explore the diverse flavours of Kuwaiti food. Today, I share the list of 10 dishes that I tried in Kuwait and relished eating them. 1. Warak Enab : An Arabic dish, Warak Enab is basically stuffed grape leaves. The leaves are stuffed with rice, tomatoes, onions, parsley, fresh mint and slowly simmered in a bath of olive oil and lemon juice. The result is a smooth silky rich and a bit sour dish that simply melts in the mouth! 2. Machboos : It is considered as the national dish of Kuwait. 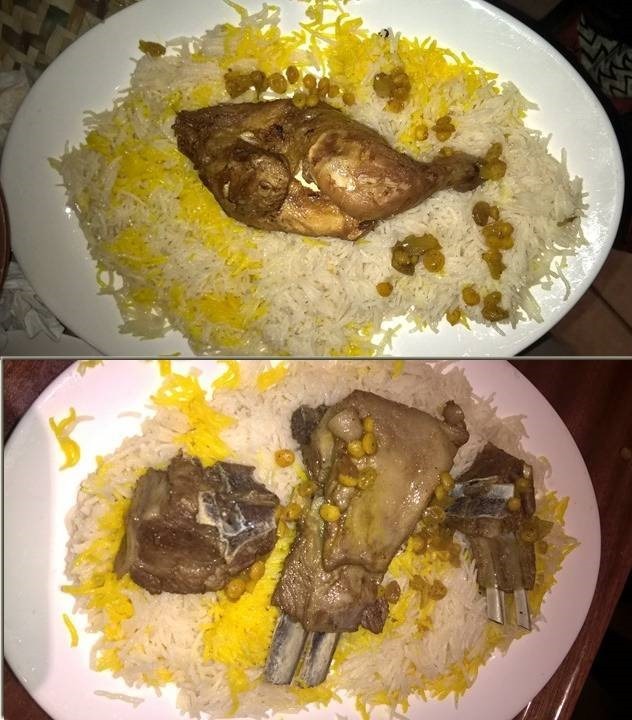 Machboos is a rice dish served with meat (chicken, lamb, fish). Basmati Rice is cooked with saffron and rose water. The meat is cooked separately and served on top of the rice. This is then eaten with a red sauce known as Dakkous which is made up of tomatoes, black pepper and garlic. The pictures here are of Chicken and Mutton Muchboos. An interesting dish, isn’t it? 3. Jireesh (Yireesh) –This is another Arabic dish which is like our broken wheat dalia only cooked with chicken or lamb along with spices and tomatoes. I know the picture below is not that appealing but it can be an ideal comfort food. 4. 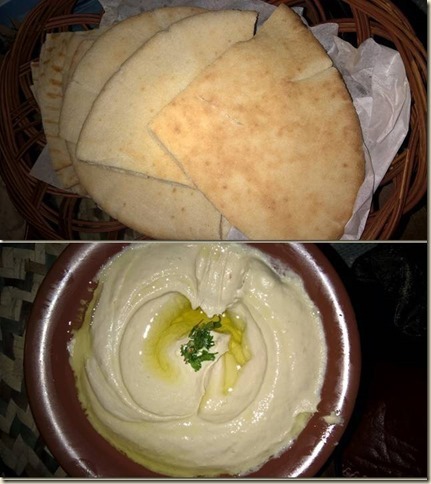 Kuboos and Hummus : Kuboos is an Arabian pita or flat bread made up of wheat flour and baked in hot oven. 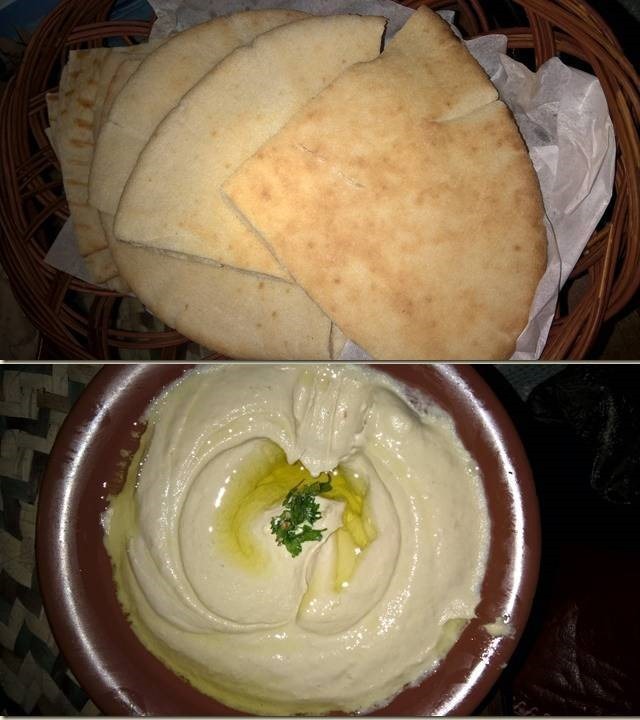 It is eaten with Hummus which is a very popular and traditional Middle Eastern dip or an accompaniment. It is made of chickpeas which are mashed and blended with spices and olive oil. I liked the way the hummus is served in dishes with swirls and hollow in the centre and garnished with different things viz chopped tomato, cucumber, coriander, parsley, caramelized onions or sautéed mushrooms. 5. 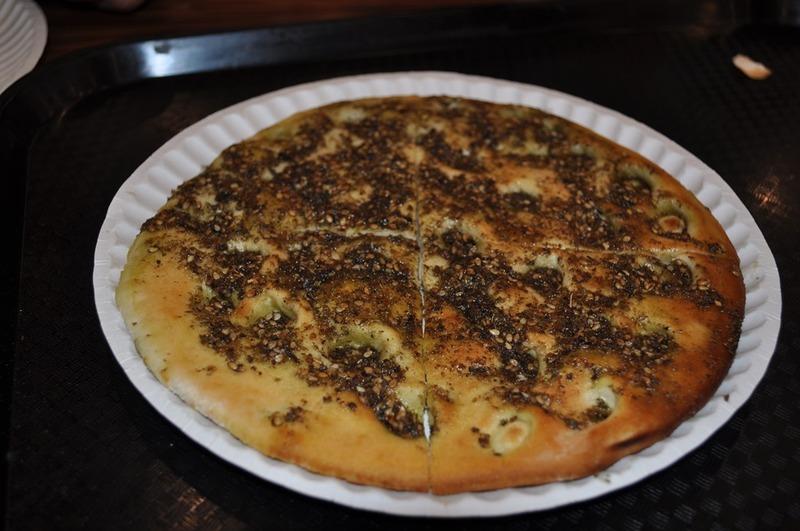 Fatayer Lahme, Fatayer Jibna and Fatayer Zaatar : These are stuffed Arabic breads. 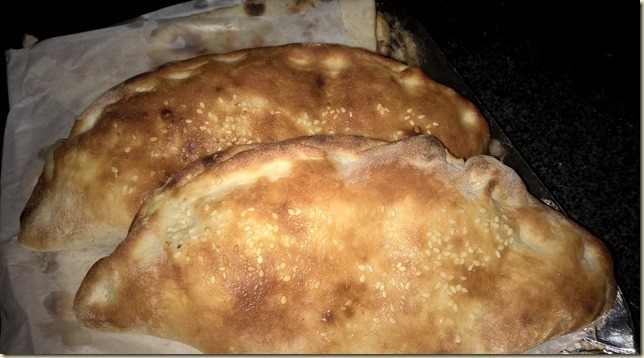 Fatayer Lahme is a bread stuffed with minced meat. Fatayer Jibna is a flat bread stuffed with cheese. And Fatayer Zaatar is a pizza like bread, the top of which is smeared with thyme, sesame seeds and some other herbs and spices. These can be shaped in the form of pastry pies and triangles or boats. 6. 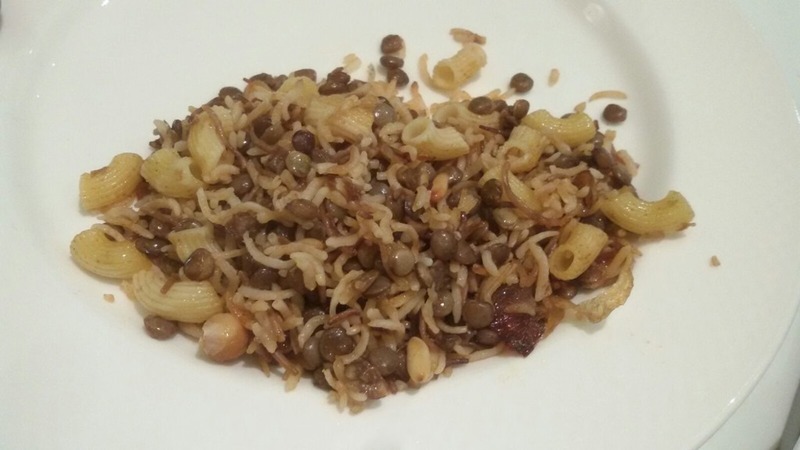 Kushari : Kushari is an Arabic Egyptian dish made up of rice, lentils and macroni. It is topped with tomato sauce and crispy fried onions. Kushari is like our Khichdi minus the macroni. 7. 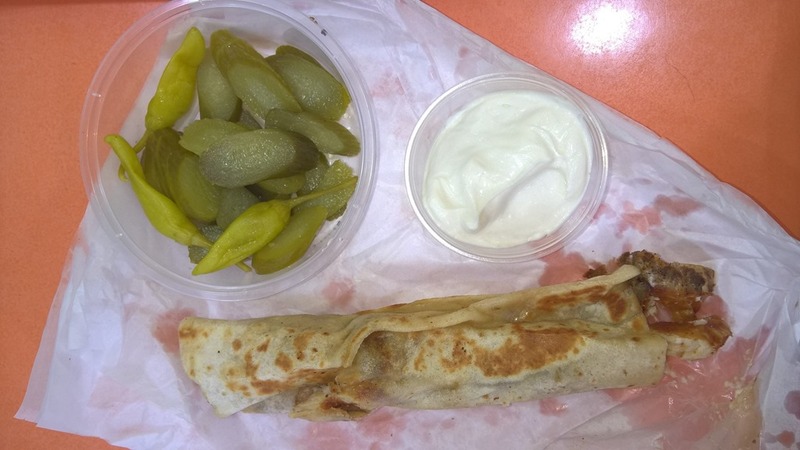 Shawarma : Shawarma is considered as the little piece of heaven here on earth. 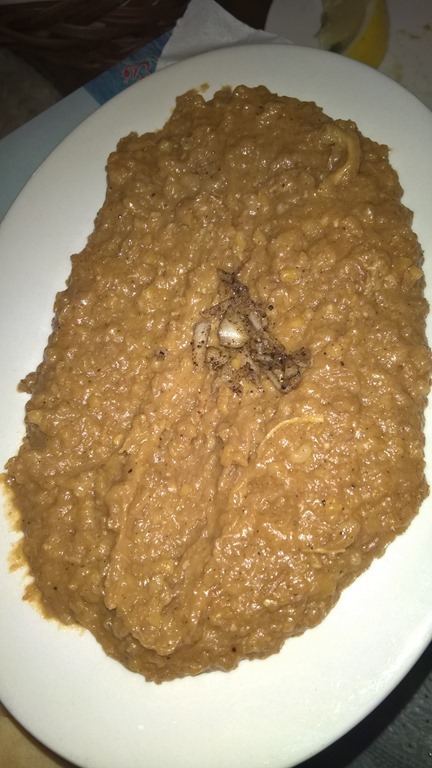 It is yet another Arabic dish. It has thinly sliced cuts of meat, like chicken, beef, goat, lamb, rolled into a large piece of flatbread. It is eaten with with fries, salads like tabouleh, falafel, hummus or pickled vegetables. I liked the process of making the Shawarmas. Raw meat is placed on large, rotating cones. As it rotates, the meat is cooked slowly on all sides by a heat source below. The meat is thinly sliced by a chef with a large knife. It can be eaten in a plate or as a wrap. 8. Kebabs : As I mentioned earlier, I am not an ardent non-veg food lover, but I do love the grilled non-veg dishes. I have had kebabs and grilled food at many places, but the ones that I had at this Kuwaiti restaurant were simply mind blowing. The mutton seekh kebabs simply melted in my mouth and the flavours were so rich. 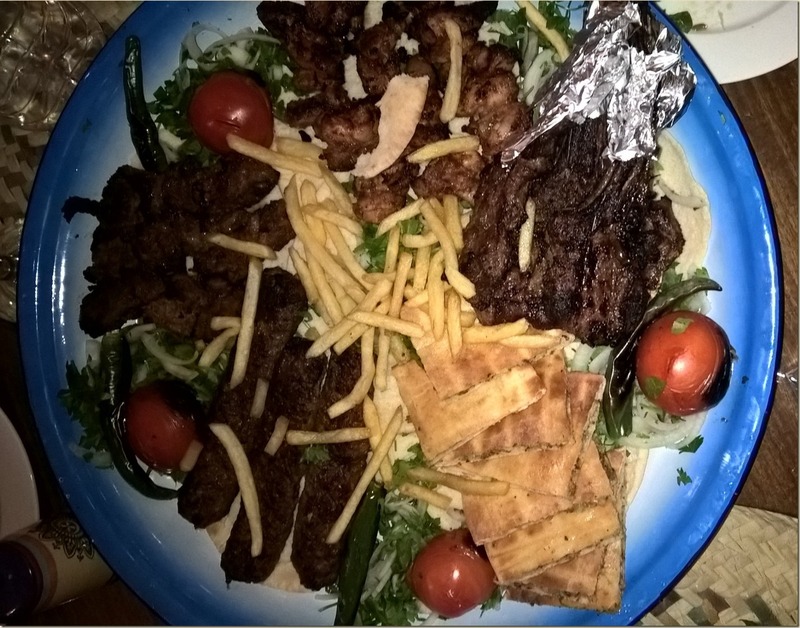 In this platter we had various varieties of juicy and delicious grilled chicken and mutton kebabs. Aah! I feel like having them again, now! 9. 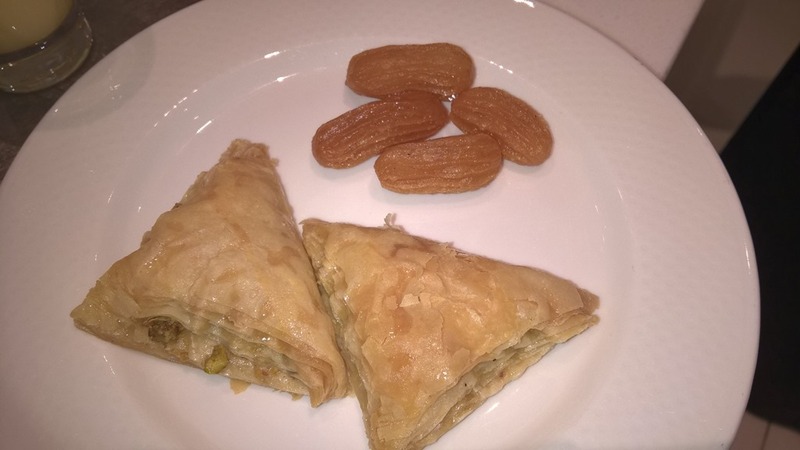 Luqaimat : It is a popular Arabic sweet dish that is enjoyed during the month of Ramadan. These are sweet dumplings which are crunchy from out side (like jalebi) and soft from inside (like gulab jamun). Now, I call this as a double bonanza, because I get two of my favorites in one dish. 10. Balah El Sham and Katayef : I have seen and heard a lot about these sweet patties and pastries on Food Safari. And when I saw them at the buffet, my heart gave a whoop of joy. Balah El Sham are churro-like, Middle Eastern fritters which are crunchy on the outside and squishy soft on the inside. Katayef is a pancake pastry filled with sweet cheese and nuts and then fried or baked and served with a hot syrup. Needless to say that they are simply YUM!! I was just checking my notes and camera and there are still so many foods and dishes that I must write about, but I shall leave that to next time. Have you tried these dishes? Which is your favorite Kuwaiti / Arabic dish. Is there any dish that you would recommend me to try out in Kuwait? It all looks so good, Shilpa! The Jireesh reminds me of a Swiss dish (Birchermuesli) and the story from my father that if he had not helped my mother prepare it, he might not have been willing to eat it! 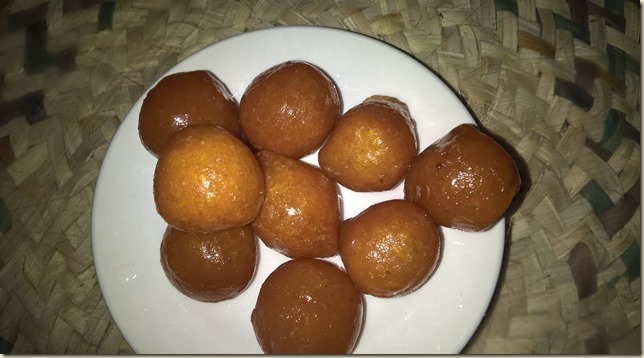 Wow Shilpa, mouth watering dishes…. was feeling so tempted after seeing this pics, I put a cake piece in my mouth:):) I don’t think I can remember the names; but the images will not go easily, thanks for sharing !! They all look and sound yummy. Lucky I’ve already eaten otherwise I would be very hungry. Delicious post Shilpa. The pictures are to die for even though I wouldn’t get half those names right. Nice list Shilpa, Looks Yumm 🙂 I am a vegetarian and I love Gulabjamoon and Jilebi. I might like Luqaimat. Heard Arabian non-veg dishes are tasty. We have many restaurants who serve Arabian dishes in Hyderabad. Yes, you will definitely like Luqaimat, Mahathi. Oh, is it? 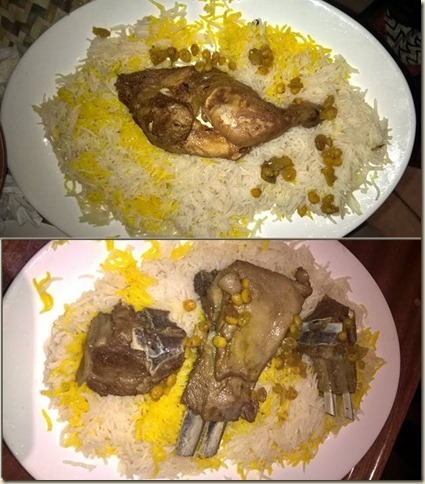 Was not aware that Arabic dishes are popular in Hybd.So, now I know where to check out the dishes in this post in India 🙂 Thanks for sharing. You are spot on, Jayashree. The original Kushari recipe from Arabia is made up of rice and lentils just like our khichdi. History says that the 19th century Egypt was a multi-cultural country.So, the Italians immigrants gave a twist to this recipe and added macroni and that’s how it got popular in Egypt and then at other places. Kushari used to be sold on food carts in its early years, and was introduced to restaurants in later years. Well , You have covered almost all the best dishes …. I see that you went to Shuwaikh Cafeteria for the Fatayer , their cheese fateyer is one the best in kuwait but you should try the fateyer from the Sultan Center … I would recommend you try the Majboos and the zubeedi as well as soup with bread from freej Swaleh in Salmiya – it is a proper Kuwaiti Restaurant , the different types of Shawerma from Dandoosh with salad & potato (Bneid Al gar) , The Spicy Chicken Tikka, Puri from Khyber (Maliya) , The Falafel & Falafel sandwich (Mushakel) as well as humus from Canary ( Farwaniya,Fahaheel, Jleeb), The mix grills from Shatter Abbas (Mubarakiya) , Mix grills from Naz (Dasman,Salmiya,Jabriya), Falafel & humus from Kunha , the Kunafa (from any Kuwaiti sweet shop ) to name a few 😀 …………. Bon Appetite !! I must say that I am thrilled to see your detailed comment here. Yes, we went to Shuwaik Cafeteria for the Fatayers. And we have had Fatayer from Sultan Centre too. We have been to Freej Al Swaleh and have had Majboos (mentioned in post above) and Soup with bread too. Missed having Zubeedi. Reading posts like these make me hungry. Such a mouth-watering variety. I enjoy non vegetarian food, but especially love them grilled, as I don’t grill them at home very often. P.S. Did not expect to find macaroni there! Interesting! 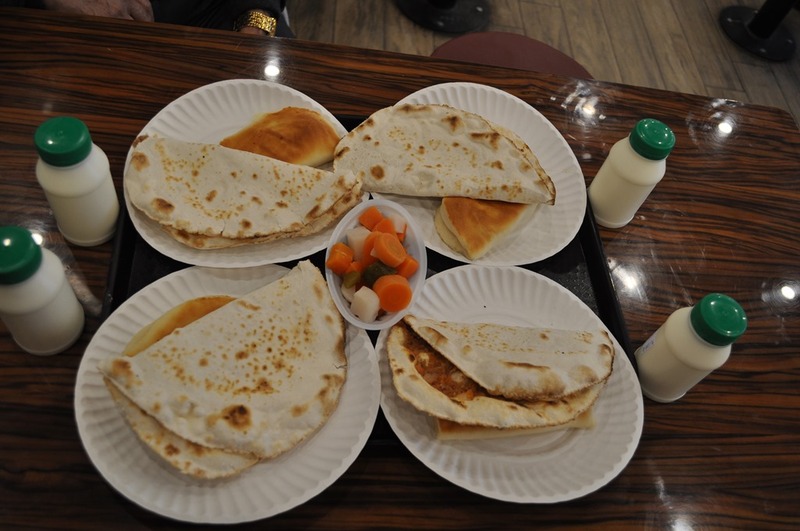 Oh, Kuwaiti food has a huge variety and that’s because of the different cultures that are part of this country. Macroni is because of that only… came from Italian immigrants! You should start a separate Food Blog. Your way / neatness in capturing Yummy food is way ahead of a normal blogger. Hats off to you…This pic + post combo meal serves great. Wow great and sweet list. Hi Shilpa. I liked all your posts. Check out Foodpanda coupons if you wish to shop at Foodpanda. #10 looks delicious. So many different kinds of food of which I have never heard before. Like many others said, did not expect to see macaroni in this list. Loved this post Shilpa! Hope to see more posts on your Kuwait trip. Many were new to me too. Yes, Macroni is a surprise ingredient. They say that the Italians immigrants gave a twist to Kushari and added macroni and it got popular in Egypt and then at other places! I still ahve so much to share about this trip. Hope to write about it soon! I loved shawarma too and that too the chicken one! You must try fathoosh !! 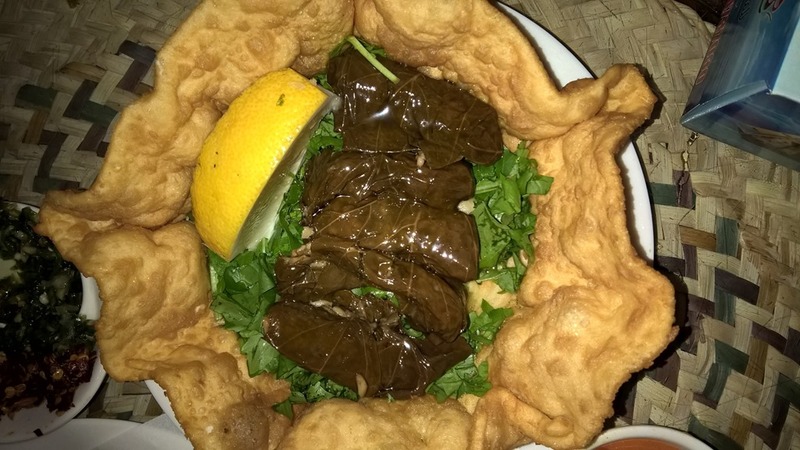 A lebanese salad!! Yes, have tried that. The inclusion of bread in the tossed vegetables makes it different. Thanks for sharing, Shan. Thanks for all your LIKES on my blog!